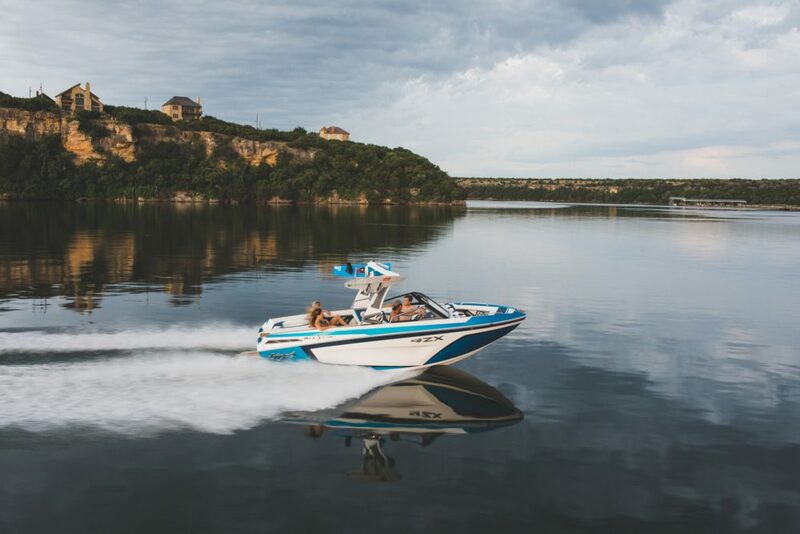 The new 2019 Tige ZX5 is a chart topper designed to let you focus on fun while the boat does the work. 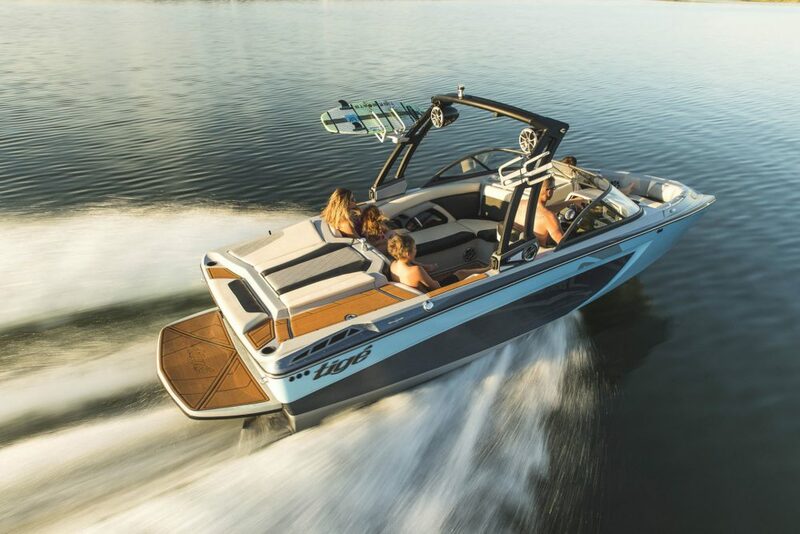 The 2019 Tige ZX5 has ample seating for 19, along with a long list of premium standard features like the TAPS 3 Surf System and the CLEAR User Experience provided through a touch-screen display. In standard trim, the ZX5 has 3,000 pounds of underfloor ballast and 1,100 pounds worth of “plug and play” bags in the compartments to either side of the engine—making it the ideal wakesurfing machine. 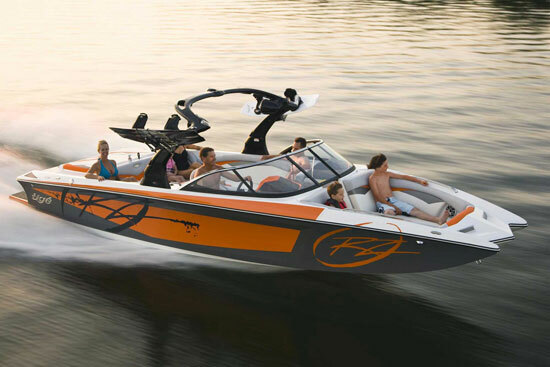 See our Tige ZX5 listings, or learn more about other ski and wakeboard boats on our explore page. When you have the chance to spend a day in boat you’re considering, it’s a little like taking a long trip with your fiancée: You find out what you’re getting into before making a full commitment. 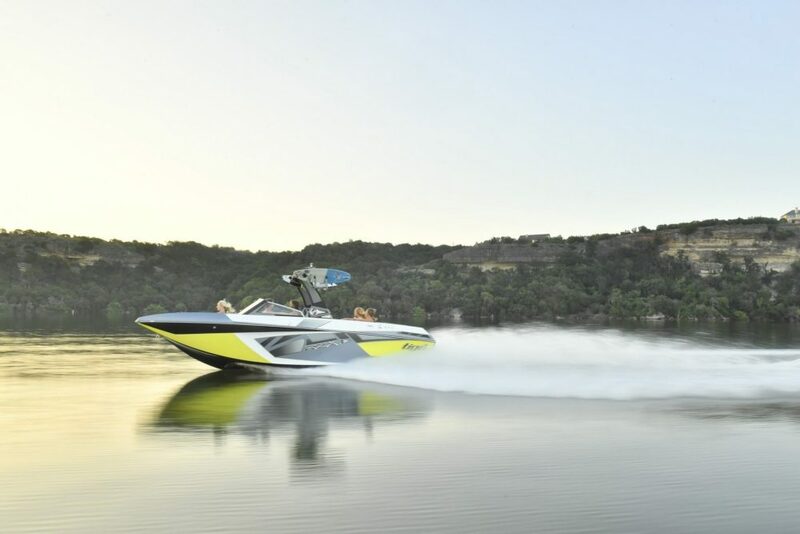 We had the chance to do just that with Tige’s new ZX5, a flagship in its lineup of multi-sport boats. If the boat were our fiancée, we’d have no trouble committing. 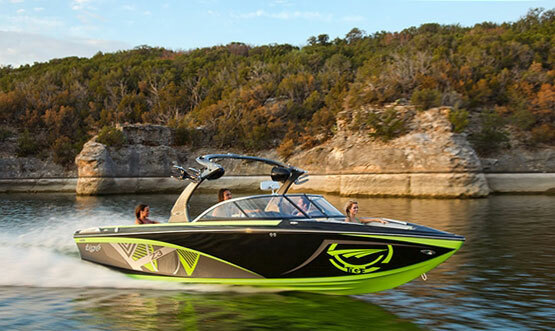 One of the more interesting—and engaging—parts of the boat is the touch-screen display, what Tige calls the CLEAR User Experience. Using it and seeing how it displays all the boat’s information and controls all its systems gives you an idea how comprehensive the system is. We know that much of the cost of a boat is wrapped up in the labor it takes to build one. Boats are hand built, so that makes sense, but we can see how a lot of that labor is now in coding and programming all the major and minor functions into the touch screen. It literally does everything. Sure, there are redundant controls for the stereo and for the TAPS 3 Surf System, but those are superfluous. You can get all the information need and control any system on the boat with a few taps on the CLEAR screen. But here’s the thing: It’s easy to use. The 10.6" CLEAR User Experience provides a large surface area, a bright screen and clear forward visibility, allowing you to easily access all the action on a tablet style that you're already accustomed to. But let’s move on to other things, namely the wakes the ZX5 makes. Or, more appropriately, waves. They’re waves, really, and it starts with the prodigious amount of water ballast you can pump onboard the ZX5. In standard trim, the ZX5 has 3,000 pounds of underfloor ballast and 1,100 pounds worth of “plug and play” bags in the compartments to either side of the engine. Filling and draining them is simple via the CLEAR screen, with its “fill all” and “drain all” buttons on the screen. For wakesurfing, which has a lot of advantages in terms of injuries over towed sports, it’s possible to crank up the wave behind the boat so that it actually has a curled face and a break. The best thing about it is no one else can “drop in” on you and take it away. It’s your wave for as long as you want to ride it. To tailor the wave to your liking, you set it with a combination of ballast weight and the settings on the TAPS 3 tabs on the transom of the boat. There’s not just one setting. They are infinitely adjustable, which is unique in the wakesurfing boat market space. 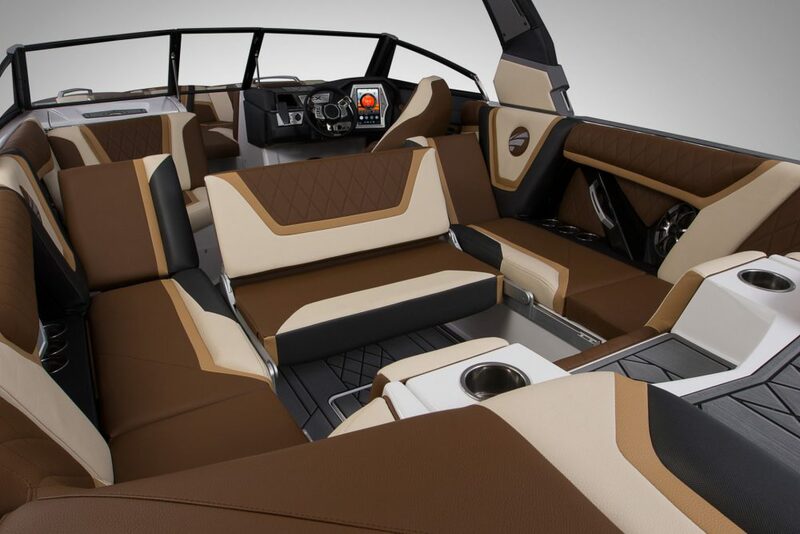 Of course, the rider is just one person, so Tige outfitted ZX5 with a plush interior fitted to let you have the fun while the boat does the work. For example, board racks swivel inward and outward with a simple pull knob. The port cushion flips up to provide a rear facing lounge. What’s more, the aft bench flips forward to create aft facing bench in the middle, which dovetails nicely with the angled back rests on the starboard side, so there’s lot of places to sit and watch the action behind the boat. If we had a complaint about the ZX5, it would be that the rear struts don’t hold the lid of the surf locker open, but we’re told the fix is in the works. With space for 19, there's plenty of room for fun onboard and countless areas to watch the action in the wake. It’s even possible to do that from the bow. Because there’s so much weight in the aft section during wakesurfing, the boat sits nice and high so you can see the action in the back. It’s also a nice, deep bow seating area, so you’re tucked into the gunwales rather than towering over them. There’s GatorStep Non Skid foam covering the sole and walk-throughs, stowage for gear and electronics and the outlets to repower them over the course of a long day on the lake. The ZX5 is something of a gestalt. Yes, it’s made of fiberglass, plastics and metal by human hands—and some pretty deft software engineers—but it’s somehow more than just a wakesurfing boat. It’s a flagship for the brand, the culmination of what Tige is capable of, and it’s a pretty great place to spend the day.